A Sheffield manufacturer has a major contract with Waitrose to design and install outdoor horticultural pods. 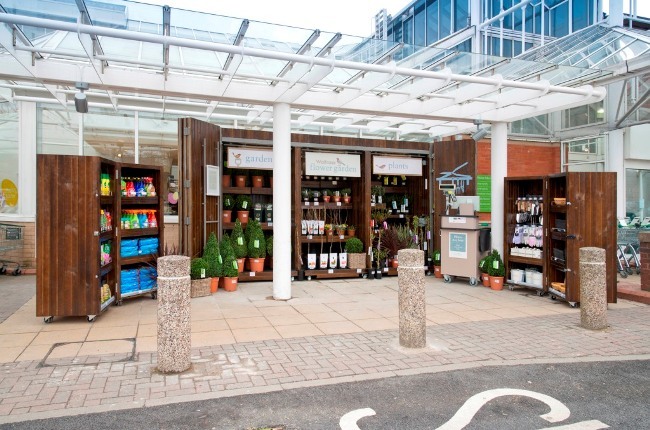 By the end of May, Birley Manufacturing will have kitted out more than 20 stores with the bespoke units, which will provide a new, exterior display area for a range of outdoor plants, shrubs and accessories called Waitrose Flower Garden. The project forms part of a long standing relationship between Birley and Waitrose which has involved work in a variety of in-store departments including the Waitrose cafes, hospitality areas and fresh meat, fish, delicatessen and bakery back wall counters. The horticultural pods are manufactured from fire treated European Redwood and stained in dark oak. Each large unit comprises a series of moveable shelving and lockable doors to ensure the whole unit can be made secure at the end of the trading day. Smaller mobile units sit alongside to provide a substantial retail display area with easy access for customers. Birley has worked closely with Waitrose to ensure that all project requests have been implemented with immediate effect and all 25 units will be installed over six weeks. The Birley installation team works to a tight and efficient schedule meaning that each pod is installed within a day. Waitrose can then fill the unit the following day allowing an installation to trading time of just 48 hours. We have an excellent relationship with Waitrose and the success of this project is partly due to the effective communication channel we have with key decision makers. Birley Manufacturing is one of the UK’s leading manufacturers for interior environments and rail carriage equipment and works with some of the UK’s top names, such as HSBC, RBS and First Great Western Trains. Theakston’s call real ale enthusiasts to The Bar!